My love affair with all things tiny shows no signs of burning itself out. I’ve never really tried designing amigurumi – there are too many fabulous and talented designers making tiny marvels already – but after finishing “the book” I just need some downtime and amigurumi seemed the perfect choice. This week has had an autumnal feel about it and so a tiny pumpkin was inevitable I suppose. here it is, another freebie (I know, I’m just too good to you at the moment!) You will whip these up in no time at all! The smallest version was made using DMC Woolly and a 2.75mm hook, the larger was made using cotton chenille from my Mother in Law’s stash, I used a 3.5mm hook for that one. 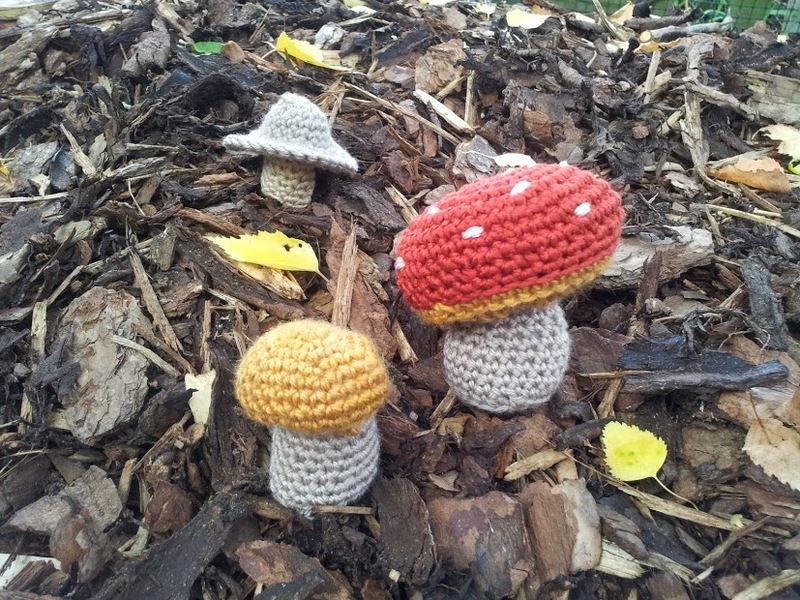 You’ll need a tiny length of brown or green yarn for the stalk. Sizing and tension: Obviously, your pumpkin will turn out slightly differently because you’re going to dive into your stash, find some suitable yarn and get hooking. So, don’t worry about tension – just make sure the stitches are tight enough that the stuffing won’t show through the fabric. You’ll also need some hollow fibre toy stuffing (or old tights -yes, some of us do still keep old tights for toy stuffing!) and a sharp needle with a large eye and a stitch marker is helpful to keep track of each round. Notes: The pumpkin is made in spirals, do not join and do not turn at the end of each round. 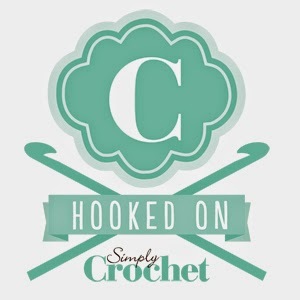 I have used standard UK crochet abbreviations throughout. 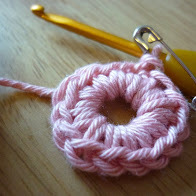 With your chosen hook and yarn make 6ch, join with a slip stitch to make a ring. Rounds 7,8, 9: 1 dc in each dc around. Cut yarn, leaving an extra long tail (this is used to make the pumpkin segments) and thread yarn tail onto a sharp pointed needle, draw yarn through the 6 dc to close the hole at the base. Do not fasten off yarn. Bring the yarn to the top of the pumpkin and insert the needle through the centre ring, wrap the yarn around the pumpkin side and insert the needle back into the base, pulling it out at the top. As you pull gently on the yarn, the sphere will squash down and you’ll see how the segments are created. Repeat 5 times, evenly spacing the segments around the pumpkin. Fasten off the yarn at the base. Make 7 ch, sl st into 2nd chain from hook, make 1 sl st in each ch to end. fasten off leaving a long tail. Thread the yarn tail onto your needle and sew to the top of the pumpkin. Larger pumpkins may need longer stalks, just make a longer chain. Of course, you can make even larger pumpkins by making more increase rounds, just work an extra straight round for each increase round and remember to decrease in sequence. 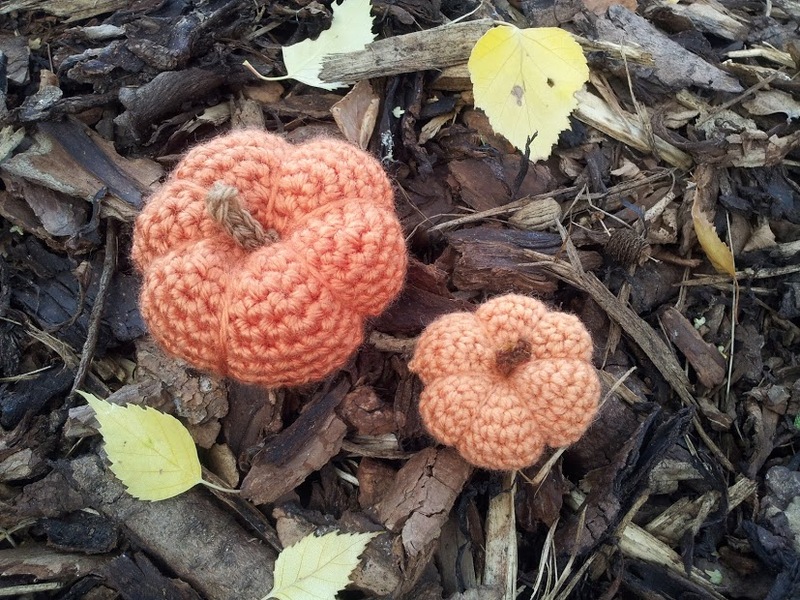 And if you thought I was crackers for making tiny pumpkins – here’s what else I hooked up yesterday! Thank you for the wonderful pattern. 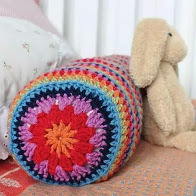 I have some similar yarn in my stash, I was wondering what I could do with it (I’m stash busting at the moment) now I know!